Hockey in Duluth started as an outgrowth of ice polo which was being played in St. Paul, Minneapolis, and Duluth in the late 1890's. The first hockey games in Duluth were played by youths on the ice on Lake Superior Bay. By 1900 adult teams in Duluth and Superior were playing the game. They played among themselves but also played teams from Two Harbors, Eveleth, and from Upper Michigan's Copper Country. In the period 1904-1910 Duluth, St. Paul, and Two Harbors entered into Minnesota State Senior tournaments. The first strong team from Duluth was the Northern Hardware team, which won the Minnesota title in 1908 after defeating Cleveland and Detroit to claim the national championship. During the period of 1900 to 1913 most of the games were played on outdoor ice, although on occasion a game was played on the small surface of the Duluth Curling Club, when in 1913 the Curling Club Arena was opened with a smaller than normal ice surface, and seating to accomodate 2,000 fans. Joe Linder brought in players from the Copper Country in 1914 and formed a strong team called the Duluth Hornets that competed against Michigan's Upper Peninsula teams from Calumet, Portage Lake, Houghton, Hancock, as well as occasional games with clubs from Cleveland, Fort William, Port Arthur, St. Paul, Winnipeg and Sault St. Marie. For the 1920-1921 season the Hornets from Duluth joined the strong USAHA and played in Group 2 with Cleveland and St. Paul. In later years they were grouped with Eveleth, St. Paul, Pittsburgh, and Minneapolis. For the 1926-1927 season the USAHA turned professional to become the AHA with franchises in Duluth, St. Paul, Minneapolis, Winnipeg, and Chicago. Later Tulsa, Kansas City, and St. Louis joined the circuit. During this time the Hornets had strong teams, winning the schedule in both 1926-1927 and 1927-1928 and the playoffs in 1926-1927. Many Canadian imports played for the Duluth American Legion, and Hornet teams of the 1920's. Among them were Leo LaFrance, Herbie Lewis, Mike Goodman, Laurie Scott, Vern Turner, Jim Seaborn, John Mitchell, Moose Jamieson, Kenny Dunfield, and others. During the first quarter of the century, George "Nobby" Clark, Coddy Winters, Arnie and Gus Olson, Iver Anderson, Jimmy Owens, Gordon Hegardt, and Helmer Grenner were outstanding local players. Winters, who later played for Cleveland, was one of the three best American born and developed players in the first 25 years of the century. In ability he ranked along side of Moose Goheen, and Hobey Baker. In the 1920's the USAHA was the strongest league in all of hockey with the exception of the major leagues. To accommodate the larger crowds attending games at the Curling Club Arena, the large Amphitheater was opened in 1924 with crowds of 4,000-5,000 commonplace. In 1939 during a Fire-Policeman benefit game in front of 4,000 fans the roof of the Amphitheater collapsed. Fortunately all of the fans escaped serious injury. This placed temporary skids on Duluth Hockey until 1953 when artificial ice was installed in the Curling Club Arena. Professional hockey left Duluth during the winter if 1933 when the Duluth franchise moved to Wichita to become the Wichita Blue Jays. 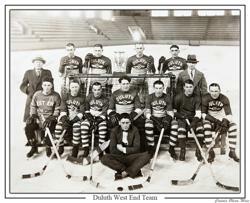 With the exception of the 1933-1934 season when Duluth placed a team in the Central Hockey League, professional hockey in Duluth had ended forever. In the period 1900-1920 High School hockey was played on an intermittent basis as there were no other High Schools in the area-- other than Duluth Central that started play in 1903--that played the game. When a Duluth High School team was organized it had to play Senior and Intermediate club teams. In the early 1920's Eveleth, Hibbing, Virginia, and Chisholm added hockey to their programs and Duluth High Schools were able to form a regular schedule that included High School competition. In 1922, in a game that was billed as being for the Minnesota State High School mythical championship, Duluth Central lost to St. Paul Central 5-3. Many former Duluth High School players during the twenties and thirties played college hockey at such school as Minnesota, Michigan, Wisconsin, Marquette, and prominent eastern colleges. College hockey in Duluth was first played when Duluth State Teachers College started the sport in 1930 and turned in a 0-3-0 record. The next season of 1931 DSTC sported a 2-5-0 season. Following the 1931 season, the college dropped the sport until reestablishing it for the 1946-1947 season. Under Joe Oven, DSTC had a respectable 11-6-1 performance for the 1946-1947 campaign. DSTC became University of Minnesota-Duluth and joined the MIAC for the 1949-1950 season. Under coaches Connie Pleban and Ralph Ramano, UMD succeeded in running up 52 straight victories against the MIAC before withdrawing from the league and playing an independent schedule. The Bulldogs joined the WCHA for the season of 1965-1966 where they have remained since. Under coach "RIP" Williams, a long-time Duluth hockey player, and booster, Duluth joined the International Amateur League in 1936-1937. Other league members were Port Arthur, Fort William, Eveleth, and Virginia. Later Fort Frances joined and Port Arthur and Fort William withdrew. During World War II the IAL was replaced by the Duluth Industrial League which was composed of the Coolerators, Butlers, Coast Guard, and Clyde Club. Many of the players in the league came from the Twin Cities and the Iron Range and worked in the shipyard or belonged to the Coast Guard. In 1951 the Glen Avon Peewee (15 years old and younger) team of Duluth captured the Minnesota Peewee tournament at White Bear Lake, and continued on to New York City to win the AHAUS National Championship by defeating Lynn (Mass.) and New Haven (Conn.) The win gave a boost to youth hockey in Duluth and the state of Minnesota. Bob Fryberger, a Duluth native who had played college hockey at Dartmouth, organized and coached the Glen Avon team. Thousands of Duluth citizens met the champion youth team as they arrived back in Duluth as the mayor awarded them the key to the city of Duluth. Duluth's youth hockey program of the 1950's and 1960's also produced Tommy and Butch Williams, sons of "RIP" Williams. Tommy was a member of the 1960 Olympic team which won the gold medal at Squaw Valley. He went onto to play 13 seasons in the NHL during the 1960's and 1970's, including the Minnesota North Stars. Butch played with St. Louis and California in the NHL in the 1970's. The manager of the 1960 gold medal Olympic team was another Duluthian, Jim Claypool. Jim was active for many years in organizing and coaching Duluth youth teams and served as MAHA president in the late 1950's. In the mid 1960's UMD joined the WCHA. Coach Mike Sertich coached UMD to four appearances in the NCAA tournament and was named coach of the year in the WCHA four times. In 1984 Bowling Green defeated UMD in four overtimes to capture the NCAA title. Duluth East High School has been to the Minnesota State High School tournament six times, four of them under coach Mike Randolph. In 1960 and 1995 they captured state titles. In 1963 Duluth entered into the new Arrowhead Hockey League dubbed as the Hornets as one of six teams in the league including Eveleth, Grand Rapids, Hibbing, Taconite, and Virginia. This was an attempt to rivive senior amateur hockey in the zenith city. It was recognized by Hornets officials that not all High School graduates attend college, hence the "new" amateur Duluth Hornets were revived to fill this void. The Hornets played it's home games on Sunday at the Duluth Curling Club.